Don’t go near the water ’til you have learned how to swim. If you get this message, call me, and if you don’t get it, don’t call. Nobody goes to that restaurant; it’s too crowded. The man who wrote such a stupid sentence can not write at all. Mathematics is the mother of all sciences. Mathematics has its diverse significant values and aims or goals. So, it is regarded as one of the core part of the school curriculum across the world. However, it is widely perceived as a difficult subject, to be tolerated rather than appreciated. It is considered as a major hurdle in passing the final qualifying examinations by the majority of the students, their parents as well as the learned community as a whole. It may because they did not get proper opportunities to study Mathematics. Many teachers, educators and mathematicians have responded to the challenge of teaching mathematics effectively in various ways like developing powerful pedagogical approaches or teaching learning materials and also introducing some innovations in their teaching. Recreational activities are one of the factors which help in effective mathematics learning. Though mathematics may deal with some abstractions. But, it is the mathematics teacher who should try to inculcate sufficient interest in the class room transaction so that the subject mathematics may not be treated as dull and tiresome. And the main tool to answer all these for converting mathematics into a loved and enjoyable subject to all is the curriculum and text book which directs the teacher to apply recreational activities for proper and effective mathematics learning. Recreational activities have a great role in mathematics learning and developing various skills in solving problem as well as developing creative and logical thinking. In one-way recreational mathematics is also a pure mathematics and is often difficult to distinguish pure mathematics from recreational mathematics. The pedagogic value of recreational mathematics is now widely recognized which in turn help the low achievers of mathematics and converting them into a lover of mathematics by removing fear-psychosis from their minds towards the subject. For a lover of mathematics, there is all beauty. One finds a huge treasure of pleasure after getting success in the solution of a Mathematics problem. It was the reason why Pythagoras sacrificed hundred oxen to the Goddess for celebrating his discovery of the theorem that goes by his name. In the same way, Archimedes had also forgotten his nakedness after discovering his principle. Mathematics is a compulsory but interesting core subject in the school curriculum. Recreational mathematics has a vital role in making mathematics an interesting one. Experience shows that the basic principles of learning mathematics can be made easier through mathematical fun, activities and games. If mathematics can be turned into a game it can become child’s play. Class room experience indicate clearly that mathematical puzzles, riddles etc encourage an open minded attitude in youngsters and help them to develop their clear thinking. Shakuntala Devi become famous for her simple mathematical facts converting into game, puzzle etc. Ramanujan also has no exception in this regard, above all his famous mathematical contributions. In contrary to this, a big percent of students dislike mathematics due to the lack of fun etc. in mathematics textbook as well as in class room transaction. There is enormous scope of effective learning of mathematics at elementary level through recreational games, magic etc. which not only help in removing fear psychosis of the learners but also help in developing clear concept of mathematics. The place of fun that is recreational activities in learning mathematics has been studied by the investigator in this study specially at class room as well as school textbook. This paper highlights the finding of the study particularly at elementary level. The abstract nature of mathematics makes it appear a very dull and difficult subject. As a result most of the students lose interest in the subject and try to avoid it. It is necessary to remove this indifference for mathematics from the minds of the students. They need to be motivated. Their interest in mathematics needs to be aroused and nurtured. Thus to remove the years old blame of the subject which creates fear-psychosis and hatred for the learner and to achieve higher aim of the subject which is responsible for developing a child’s inner potentialities, the role of mathematics is vital, for that recreational activities plays a great role for all these. (i) Scope should be there for removing “fear psychosis” among the learners on the subject with proper instruction for creating interest and love for the subject. (ii) Mathematics curriculum must be more realistic, practical, useful, suitable and justified upto the learner’s mental ability according to its level rather than stereo type, theoretical and traditional. (iii) It should be aimed at the learner’s 100% competency development and making her/ him a competent person covering her/his total mental growth, which can be, reflected in the day to day actions and whole life activities. (iv) Scope to be provided for the use of the essence of mathematics against the success of any type of programme at home as well as outside. (v) To make mathematics more understandable, enjoyable & permanently retained in the mind of the learner more use of fun and recreational activities, TLM, practical work, project work, interaction, exploration etc. are to be ensured and to be reflected in the curriculum specially. For this introduction of mathematics lab, mathematics corner etc. in each school/class in necessary. (vi) Effective approach of teaching learning process of the subject must be specified as activities based, learner centered, load free, stress free, enjoyable and effective. (vii) Content to be made more relevant to the children’s life and experiences and spiraling of content is necessary in mathematics curriculum at elementary level. Mathematics club can be maintained with the help of the community for spreading the message that there is no other subject like mathematics, which is so interesting, enjoyable and useful and that nothing can be done in this world without mathematics. Curriculum is reflected through the text books to the students and the teacher community. Hence, developing a learner friendly textbook is a challengeable task in present education system which to be – Joyful, Child centric, activity based, competency based and enjoyable to the children. Fear psychosis can be removed by using more number of recreational activities like fun, puzzles, riddles, stories, interesting facts and examples in the mathematics text book. Each lesson must be potential enough to construct the knowledge in the minds of the learner through their experiences in the environment by group activities, peer activities and individual activities for development of each competency by all learners. Whatever good curriculum and textbook are prepared for mathematics education, its success and the learning of mathematics depends on the teacher and the way of their classroom transaction in a learner friendly environment. Here also recreational activities plays a vital role in developing and understanding a mathematical concept in an enjoyable way by relating it to the everyday life activities so that it can be permanently retained and use as and when necessary. Using Fun and Magic can make mathematics learning very exciting and interesting. Games provide opportunities for students to be actively involved in learning. They enable students to experience success and satisfaction, there by build the enthusiasm and self confidence. 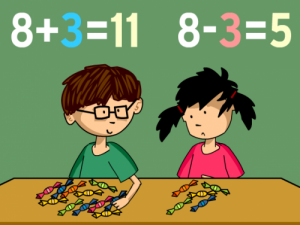 Many fun can be created in Mathematics learning in the classroom through various activities using TLM like match sticks, seeds, leaves, string, blocks, tangrams, geo-board, puzzles, songs, various games etc. These should be specially reflected in the text books at elementary stage otherwise teacher will not practice these ideas in the class room as teachers and learners are mostly dependent on the text book. • Some others have taken up research to understand more deeply the teaching and learning of mathematics. Following examples witnessed some such challenges through different recreational activities during long and short term training courses. ƒ Group forming games by applying mathematical operations creates very much excitement even among the trainees. ƒ Housie game is also a brain storming activity creates enthusiasm among the trainees . Likewise many more activities are there. These activities help in drilling the known facts and prepared the trainees/students to grasp any new concept or understand the same properly. Games Using games can make mathematics classes very enjoyable, exciting and interesting. Mathematical games provide opportunities for students to be actively involved in learning. Games allow students to experience success and satisfaction, thereby building their enthusiasm and self-confidence. But mathematical games are not simply about fun and confidence building. Games help students to: • understand mathematical concepts • develop mathematical skills • know mathematical facts • learn the language and vocabulary of mathematics • develop ability in mental mathematics. A school-wide quiz or bee can be a great way to teach students about certain subjects and test their knowledge. You may conduct a quiz bee that focuses on one subject, such as spelling or a quiz bee that tests students on several subjects, such as math, science, and social studies. You can use a live host for the quiz bee or create a school quiz bee that can be played on a computer or online. You should also take steps to ensure the school quiz bee is organized properly and runs smoothly to ensure it is a great success. Determine the format for the quiz bee. You should determine the format of the quiz bee, including the subject matter of the quiz bee, the number of students competing in the quiz bee, and how the quiz bee will unfold. Having a set format for the quiz bee will ensure it runs smoothly. • Decide if the participants in the quiz bee are going to be in teams or competing as individuals. If your school is fairly large, you may break up students into teams based on classroom so there is enough time for each team to compete in the quiz bee. If your school is fairly small, you may be able to allow the students to compete individually. • If there are going to be many teams or students competing in the quiz bee, you may have each team or student compete in heats against each other in their classrooms. The winners of each heat may then go on to the final round of the school quiz bee and compete in front of the entire school. 2. Outline the rules for the quiz bee. It may be best to keep the rules simple for a school quiz bee, as you want the quiz to appeal to a wide range of students and age groups. You should determine the rules for the quiz bee and write them down so you can reference them and share them with the participants of the quiz bee. • For example, you may institute a time limit for each response to a quiz question by a team or individual student. You may allow the host to read out the quiz question to the team and then start the timer. If you are timing the responses, have a timekeeper on hand or use a stopwatch that is large and easy for all participants to see. • You may also make a rule about what to do in the event of a tie, such as a rapid fire deciding round where whichever team or participant responds to a quiz question first wins. 3. Compile the content for the school quiz bee. Consider if the quiz bee will test students on a particular subject, such as a spelling quiz bee, or on a variety of subjects, such as mathematics, science, and social studies questions. You may pull test questions from existing quizzes from previous classes or create new test questions for the quiz bee. • You may also use sample quiz questions from standardized tests in the school quiz bee. You may go for a variety of quiz questions, ranging from very easy to very difficult to ensure the participants have a fair chance at winning the quiz bee. 1. Look for a host at your school. You can conduct the school quiz bee by first finding a host at your school, such as a teacher, a teacher’s aide, or a member of the school’s administration. If you are a teacher, you may host the school quiz bee yourself. The host should be able to be present for the entirety of the school quiz bee. 2. Bring in a guest announcer. You may also opt to bring in a host or announcer that is not from your school. This could be a parent, a former student, or a member of the community. You may choose a guest announcer who has participated in school events before or someone you believe will make a good host. 3. Make sure the host is confident in front of a crowd. You should check that the host is comfortable speaking clearly and slowly to students, as they will need to read out the questions in the school quiz bee. The host should also be able to project their voice so they can be heard in a room and have a friendly, encouraging demeanor so the participants in the school quiz bee feel supported while they compete. • You may look for a host who has experience with conducting school quiz bees or who is comfortable speaking in front of a crowd. 1. Use an existing online quiz. You may also consider using a quiz creation program on your computer to conduct the school quiz bee. You can find quiz creation programs online. Some quiz creation programs are free to use or may require a small fee. • You can use existing quizzes in the program in your school quiz bee and adjust them to fit your needs. • Some programs have an option where you allow the program to conduct the school quiz bee for you, with animations and automated cues that play when a student or team clicks on a question. 2. Design your own school quiz bee. If you are familiar with how to use animation programs, you may try designing your own school quiz bee program. You may need to use a quiz design program to create a custom quiz for your school’s quiz bee or use animation programs like Adobe Flash. • You should include interactive elements into your school quiz bee, such as buttons that trigger audio prompts or a running total of the player’s score on the bottom of the screen. You may also allow the participants to enter in text into the quiz to answer a question or have a results screen at the end of the quiz. • You may also include interesting background images in the school quiz bee and make the quiz appear visually appealing so the participants are more engaged in the content. 3. Test the school quiz bee on a school computer. Before you launch the school quiz bee in front of students, you should do a test run of the quiz on a school computer. You may put yourself in the role of a participant and run through the quiz on your own. Using a school computer to test the quiz can help to ensure it will run smoothly for students at school. • You should make sure any interactive elements of the quiz are functioning properly. You should also check to make sure the questions and answers that appear in the quiz are correct, as you do not want a participant to notice an error during the quiz bee. 1. Enlist participants. Get the word out about the event so students can sign up to compete. Ask teachers to announce it in their classes. Make posters about the event to put up around school. You want as many students as possible to be involved so everyone at school has an opportunity to compete. • You may also work with other teachers to put together a list of students to enlist as participants in the school quiz bee. This may be a list of start students or students who show potential and might make good competitors. 2. Provide sample questions to the participants. You may provide contestants with sample question packets so that they can practice ahead of time. These can be especially helpful if the competing teams plan to practice together beforehand, or if students are unfamiliar with what a quiz bee is like and want to get a sense of the question levels beforehand. • You may create your own sample question packets with questions that are similar to the questions in the school quiz bee. You may hand out the sample question packets one week before the competition so the students have time to prepare. 3. Do a practice round. To get the participants warmed up, you might want to conduct a practice round before the school quiz bee begins. These can be easy questions just so people get the hang of how it works with the reading, the timing, and their answers. • Doing this can also allow the participants to get used to the format of the school quiz bee and be better prepared to compete once the event begins. A magic square is an NxN matrix in which every row, column, and diagonal add up to the same number. Ever wonder how to construct a magic square? In recreational mathematics, a magic square is a square grid (where is the number of cells on each side) filled with distinct positive integers in the range such that each cell contains a different integer and the sum of the integers in each row, column and diagonal is equal.The sum is called the magic constant or magic sum of the magic square. A square grid with cells on each side is said to have order n.
In regard to magic sum, the problem of magic squares only requires the sum of each row, column and diagonal to be equal, it does not require the sum to be a particular value. Thus, although magic squares may contain negative integers, they are just variations by adding or multiplying a negative number to every positive integer in the original square. Iron plate with an order 6 magic square in Eastern Arabic Numerals from China, dating to the Yuan Dynasty (1271–1368). Magic squares were known to Chinese mathematicians as early as 650 BC, and explicitly given since 570 AD, and to Islamic mathematicians possibly as early as the seventh century AD. The first magic squares of order 5 and 6 appear in an encyclopedia from Baghdad circa 983, the Encyclopedia of the Brethren of Purity (Rasa’il Ihkwan al-Safa); simpler magic squares were known to several earlier Arab mathematicians. Some of these squares were later used in conjunction with magic letters, as in Shams Al-ma’arif, to assist Arab illusionists and magicians. The 3×3 magic square has been a part of rituals in India since Vedic times, and still is today. The Ganesh yantra is a 3×3 magic square. There is a well-known 10th-century 4×4 magic square on display in the Parshvanath temple in Khajuraho, India. This is known as the Chautisa Yantra. Each row, column, and diagonal, as well as each 2×2 sub-square, the corners of each 3×3 and 4×4 square, the corners of each 2×4 and 4×2 rectangle, and the offset diagonals (12+8+5+9, 1+11+16+6, 14+2+3+15 and 7+11+10+6, 12+2+5+15, 1+13+16+4) sum to 34. In this square, every second diagonal number adds to 17 (the same applies to offset diagonals). In addition to squares and rectangles, there are eight trapeziums – two in one direction, and the others at a rotation of 90 degrees, such as (12, 1, 16, 5) and (13, 8, 9, 4). The Kubera-Kolam, a magic square of order three, is commonly painted on floors in India. It is essentially the same as the Lo Shu Square, but with 19 added to each number, giving a magic constant of 72. The constant that is the sum of every row, column and diagonal is called the magic constant or magic sum, M. Every normal magic square has a constant dependent on the order , calculated by the formula , since the sum of is which when divided by the order is the magic constant. For normal magic squares of orders n = 3, 4, 5, 6, 7, and 8, the magic constants are, respectively: 15, 34, 65, 111, 175, and 260 (sequence A006003 in the OEIS). The 1×1 magic square, with only one cell containing the number 1, is called trivial, because it is typically not under consideration when discussing magic squares; but it is indeed a magic square by definition, if we regard a single cell as a square of order one. Normal magic squares of all sizes can be constructed except 2×2 (that is, where order n = 2). Any magic square can be rotated and reflected to produce 8 trivially distinct squares. In magic square theory, all of these are generally deemed equivalent and the eight such squares are said to make up a single equivalence class. Excluding rotations and reflections, there is exactly one 3×3 magic square, exactly 880 4×4 magic squares, and exactly 275,305,224 5×5 magic squares. For the 6×6 case, there are estimated to be approximately 1.8 × 1019 squares. The moment of inertia of a magic square has been defined as the sum over all cells of the number in the cell times the squared distance from the center of the cell to the center of the square; here the unit of measurement is the width of one cell. (Thus for example a corner cell of a 3×3 square has a distance of a non-corner edge cell has a distance of 1, and the center cell has a distance of 0.) Then all magic squares of a given order have the same moment of inertia as each other. Brothers and sisters, I have none but this man’s father is my father’s son. ANS- This funny riddle often amuses both kids and adults. The answer is simple – the man is my son. A fellow encountered a bear in a wasteland. Both got frightened – fellow ran to the north, bear to the west. Suddenly the fellow stopped, aimed his gun to the south and shot the bear. ANS -Albert Einstein allegedly made this riddle for his scholars. A fellow encountered a bear in a wasteland. There was nobody else there. Both were frightened and ran away. Fellow to the north, bear to the west. Suddenly the fellow stopped, aimed his gun to the south and shot the bear. What color was the bear? If you don’t know, this may help you: if the bear ran about 3.14 times faster than the fellow (still westwards), the fellow could have shot straight in front of him, however for the booty he would have to go to the south. A farmer returns from the market, where he bought a she-goat, a cabbage and a wolf (what a crazy market . On the way home he must cross a river. His boat is small and won’t fit more than one of his purchases. He cannot leave the she-goat alone with the cabbage (because the she-goat would eat it), nor he can leave the she-goat alone with the wolf (because the she-goat would be eaten). How can the farmer get everything on the other side in this river crossing puzzle? Take the she-goat to the other side. Go back, take cabbage, unload it on the other side where you load the she-goat, go back and unload it. Take the wolf to the other side where you unload it. Go back for the she-goat. That’s it. Three missionaries and three cannibals want to get to the other side of a river. There is a small boat, which can fit only two. To prevent a tragedy, there can never be more cannibals than missionaries together. 1 cannibal and 1 missionary there, missionary back. 2 cannibals there, 1 cannibal back. 2 missionaries there, 1 missionary and 1 cannibal back. 2 missionaries there, 1 cannibal back. This one cannibal takes the remaining cannibals to the other side. If you had a 5-liter bowl and a 3-liter bowl, and an unlimited access to water, how would you measure exactly 4 liters? ANS- Fill the 5-litre bowl and pour water to the 3-litre bowl, which you empty afterwards. From the 5-litre bowl pour the 2 remaining litres to the 3-litre bowl. Refill the 5-litre bowl and fill in the 3-litre bowl (with 1 litre), so there stay the 4 required litres in the 5-litre bowl. The day before yesterday I was 25 and the next year I will be 28. This is true only one day in a year. What day is my birthday? ANS- He was born on December 31st and spoke about it on January 1st. Alphametic puzzles (also called cryptarithms) are arithmetic problems which involve words where each letter stands for unique digit that makes the arithmetic equation true. For instance, this is one of the famous equations. Can you solve it? This is collection of the best puzzles selected out of +10K brain teasers. Link to solution is under each puzzle. The answer is usually in spoiler which you can unhide by clicking the “Show” button. Some of them might be quite hard, however, you don’t need any deep math knowledge. Just basic logic, creativity and patience is needed. You’ve got 27 coins, each of them is 10g, except for 1. The 1 different coin is 9g or 11g (heavier, or lighter by 1g). You should use balance scale that compares what’s in the two pans. You can get the answer by just comparing groups of coins. What is the minimum number weighings that can always guarantee to determine the different coin. Separate the coins into 3 stacks of 9 (A, B, C). Weigh stack A against B and then A against C. Take the stack with the different weight (note lighter or heavier) and break it into 3 stacks of 3 (D, E, F). Weigh stack D against E. If D and E are equal, then F is the odd stack. If D and E are not equal, the lighter or heavier (based on the A, B, C comparison) is the odd stack. You now have three coins (G, H, I). Weigh G and H. If G equals H, then I is the odd and is lighter or heavier (based on the A, B, C comparison). If G and H are not equal, then the lighter or heavier (based on the A, B, C comparison) is the odd coin. If you like this type of brain teasers, then surely check out other weighing puzzles. There are many easier ones as well. “I’m gonna give you prisoners a chance to go free tomorrow. You will all stand in a row (queue) before the executioner and we will put a hat on your head, either a red or a black one. Of course you will not be able to see the color of your own hat; you will only be able to see the prisoners in front of you with their hats on; you will not be allowed to look back or communicate together in any way (talking, touching…..). Starting with the last person in the row, the one who can see everybody in front of him, he will be asked a simple question: WHAT IS THE COLOR OF YOUR HAT? He will be only allowed to answer “BLACK” or “RED”. If he says anything else you will ALL be executed immediately. Now since you all can communicate freely during the night, can you find a way to guarantee the freedom of some prisoners tomorrow? How many? First guy is a coin toss – let’s wish him good luck. His job is to establish the parity of black hats visible to him. He says “Black” if he sees an odd number of black hats; “Red” otherwise. By paying attention to what has been said, each prisoner will know his hat’s color. Second to speak hears “Black” and sees an even number of black hats. He knows his hat is black [odd changed to even - must be his is black] and says “black”. Third guy has heard “black” and “black” and sees an even number of black hats. He knows his hat is red [even stayed even - his hat can't be black] and says “red”. And so on, to the front of the line. The first time you hear “black”, say to yourself “odd”. Each time your hear “black” after that, change the parity: “even”, “odd”, … etc. When it’s your turn, if the black hats you see match the running parity, you’re Red; Black otherwise. If you like this type of brain teasers, then surely check out other logic puzzles. Especially “Masters of Logic Puzzles” series at the bottom of that page might be of interest for you. There is a truth teller (always tells the truth), a liar (always lies), and one that sometimes answers truthfully and sometimes lies. Each man knows who is who. You may ask three yes or no question to determine who is who. Each time you ask a question, it must only be directed to one of the men (of your choice). You may ask the same question more than once, but of course it will count towards your total. What are your questions and to whom will you ask them? There are 8 possible combinations of anwers for questions: TTT, TTL, TLT, TLL, LTT, LTL, LLT, LLL. Theoretically it’s possbile if you could figure out a way to get any of the 8 combinations of answers assigned to the states, but with the unreliability of Random’s answers, I thought it was impossible. There is always a possiblity in any solution where Random will exactly mirror T or L for answers. He could always lie or always tell the truth and you can never tell when he is lying or telling the truth. This being given, I thought you can NEVER separate 6 distinct answers to apply to the 6 states, and therefore can never be sure who is who. After a minute though, I saw through my own error in logic. I was always dealing with questions where T and L would give the same answer regardless of the order of the men. I saw that if you can get T and L to give a Yes/NO answer, then you can figure out where R’s worthless answers are. The only way I saw to do this is to ask about the order of the men themselves. Ask #1 if L is standing on R’s right arm (our left if they are facing us). If YES, then it has to be T telling the truth, L telling a lie, or one of R’s worthless answers, so: TLR, LTR, or RTL, RLT. If NO, then it has to be T telling the truth, L telling a lie, or R and his worthless answers, so: TRL, LRT, or RTL, RLT. Now we know, based on the answer to #1 where to avoid R’s worthless answers. We now ask T or L “Is T in the lineup?” If answer 1 was Yes, we ask person 2, if it was no we ask person 3. Now any question separating the two possiblities works – just make sure you are avoiding R’s worthless answers. So we have the order and know who is who. If you like this type of brain teasers, then surely check out other logic problems. There are many easier ones as well. Three boxes are all labeled incorrectly, and you must get the labels right. To gain the information you need to move the labels to the correct boxes, you may remove a single item from one of the boxes. You may not look into the boxes, nor pick them up and shake them, etc. Can this be done? If so, how? If not, why not? Remove an item from box 3. The item tells you what label to put on box 3. Move the nails and screws label to the box labeled with the other item, and its label to the remaining box. Example: you remove a nail from box 3. Move the label nails from box 1 to box 3. You can’t move the nails and screws label to box 1: that would be a swap, and all three labels must be corrected. Move it instead to box 2, and the screws label to box 1. Teanchi and Beanchi are a married couple (dont ask me who he is and who she is)! They have two kids, one of them is a girl. Assume safely that the probability of each gender is 1/2. What is the probability that the other kid is also a girl? Hint: It is not 1/2 as you would first think. Of course, it’s not 1/2 else would make it a lousy puzzle. This is a famous question in understanding conditional probability, which simply means that given some information you might be able to get a better estimate. Since we know one of the children is a girl, we will drop the Boy-Boy possibility from the sample space. You are on a game show and there are three doors. The presenter tells you that behind one of doors there is a car and behind the other two are goats. If you pick the car you win it. After you have picked a door the presenter opens a different door with a goat behind it, he then gives you the chance to change what door you open. What should you do? Jennifer should switch. Contrary to what may seem intuitive, switching actually doubles her chances of winning the car. This problem is just a re-wording of what is known as the Monty Hall Problem. The key to understanding it is that the host knows the locations of the car and goats. His knowledge changes his actions and thus affects the odds. There are (1:3 + 1:3 = 2:3) chances that switching will get Jennifer the car, and only (1:6 + 1:6 = 1:3) chances she would get the car by not switching. She should switch. At the start of the game, there is a 2:3 chance that Jennifer will pick a door with a goat behind it. If she does, the host will reveal the other other goat, and switching doors will get Jennifer the car. There is a 1:3 chance she will pick the car. The host will then reveal a goat. Switching would win Jennifer a good supply of Ch?vre (and the disdain of her neighbours). So, 2 out of 3 times switching gets the car. Simple – unintuitive, but simple. Question 1: What is the next two rows of numbers? Question 2: How was this reached? The secret is to say whay you see on each line and what you see becomes the next line. For full answer see below. 8. HOW DID IT HAPPEN? A man runs a mile south, a mile west, and a mile north and ends up back where he started! How did it happen? That might be easy but the harder part is that there are actually an infinite number of answers for where the man could have started from. Explain. Any point on the circle (1 + 1/2pi) miles from the South Pole. and be able to go a mile North to the starting point. 1 + 1/2Npi miles North of the South pole where N is any positive integer. N is then the number of circular laps in your westerly mile. e.g. N=5280 – you’d run 5280 laps around a 1-foot circumference circle. A 6-inch hole is drilled through a sphere. What is the volume of the remaining portion of the sphere? the hole is a circular cylinder of empty space whose axis passes through the center of the sphere – just as a drill would make if you aimed the center of the drill at the center of the sphere and made sure you drilled all the way through. the length of the hole [6 inches] is the height of the cylinder that forms the inside surface once the hole is drilled. picture the inside surface as viewed from inside the hole and measure the length of that surface in the direction of the axis of the drill. in this sense, you could for example drill a 6-inch hole through the earth. the diameter of the hole would be huge, and you’d just have a tiny remnant of the earth left. but if you could set it on a table [a big table] it would be 6 inches high. You of course could not drill a 6-inch hole through a sphere whose diameter was less than 6 inches. This fact leads to the logical answer. The hard way involves calculus. The easy way uses logic. Radius of sphere = R, radius of hole = r, length of hole = 2L [so L=3], height of cap = h.
Since r*r = R*R – L*L and h = R-L, we can eliminate r and h and do everything in terms of R and L.
Pretty amazing: the volume removed by a hole of length 2L is the difference of the volumes of two spheres: one of radius R, the other of radius L.
V[remainder] = (4pi/3)L*L*L = 36pi. My friend wouldn’t have posed a math problem [boring] and she wouldn’t have left out critical information. Therefore the answer couldn’t depend on the radius of the sphere. I chose a sphere size [radius=3] that would make 0 volume removed [a hole of length 6 and diameter 0]. With nothing removed, the remaining volume is the original volume: (4pi/3) 3*3*3. When I divide it by 2, the remainder is 1. When I divide it by 3, the remainder is 2. When I divide it by 4, the remainder is 3. When I divide it by 5, the remainder is 4. When I divide it by 6, the remainder is 5. When I divide it by 7, the remainder is 6. When I divide it by 8, the remainder is 7. When I divide it by 9, the remainder is 8. When I divide it by 10, the remainder is 9. It’s not a small number, but it’s not really big, either. Find the smallest number with such property. The number has to end in 9. Looked brute force for small numbers. 59 and 119 were promising, but no cigar. Still think of this as kind of brute force. Students need to decide what affects the length of time for 10 swings and how it affects it. For example, how does increasing or decreasing the length of string or the weight of the stone affect the time taken for 10 swings? To discover these relationships, students can draw graphs of the relationship between time and length of string or between time and weight. Give students the following problem. You and a friend are on a journey. It is nearly night time and you have nowhere to stay. You have a rectangular piece of cloth measuring 4 m by 3 m. Design a shelter to protect both of you from the wind and rain. • what you will use to support the shelter – trees, rocks etc? • estimate the heights and lengths of the shelter. • the greater the number of times an experiment is repeated, the closer the relative frequency gets to the theoretical probability. Put different coloured beads in a bag, for example 5 red, 3 black and 1 yellow bead. Invite one student to take out a bead. The student should show the bead to the class and they should note its colour. The student then puts the bead back in the bag. Repeat over and over again, stop when students can say with confidence how many beads of each colour are in the bag. = 9, so runner 9 moves forward one square. Play the game and see which runner finishes first. Repeat the game a few times. Does the same runner always win? Is the game fair? Which runner is most likely to win? Which runner is least likely to win? Change the rules or board to make it fair. Make a few geoboards of different shapes and sizes. Students can wrap string or elastic around the nails to make different shapes on the geoboards like triangles, quadrilaterals. They can investigate the properties and areas of the different shapes. TOPICS Triangles, quadrilaterals, congruence, vectors. • How many different triangles can be found on a 3 x 3 geoboard? Classify the triangles according to: size of angles, length of sides, lines of symmetry, order of rotational symmetry. Find the area of the different triangles. • How many different quadrilaterals can be made on 4 x 4 geoboards? Classify the quadrilaterals according to: size of angles, length of sides, lines of symmetry, order of rotational symmetry, diagonals. Find the area of the different quadrilaterals. • Can you reach all the points on a 5 x 5 geoboard by using the three vectors shown? In how many different ways can these points be reached? Always start from the same point. You can use the three types of movement shown in the vectors in any order, and repeat them any number of times. Explore on different sized geoboards. This teaching method is about encouraging students to learn mathematics through solving problems and puzzles which have definite answers. The key point about problem-solving is that students have to work out the method for themselves. Puzzles develop students’ thinking skills. They can also be used to introduce some history of mathematics since there are many famous historical math’s puzzles. Textbook exercises usually get students to practice skills out of context. Problem-solving helps students to develop the skills to select the appropriate method and to apply it to a problem. Put the numbers 1,2,3, 4, 5, 6, 7, 8, 9 into a 3 x 3 square to make a magic square. In this 3×3 magic square, the numbers in each vertical row must add up to 15. The numbers in each horizontal row must add up to 15. The diagonals also add up to 15.15 is called the magic number. • How many ways are there to put the numbers 1-9 in a magic 3 x 3 square? • Can you find solutions with the number 8 in the position shown? • There are 880 different solutions to the problem of making a 4 x 4 magic square using the numbers 1 to 16. How many of them can you find where the magic number is 34? • What are the values of x, y and 2 in the magic square on the right? The numbers 1 to 9 have been arranged in a square so that the second row, 384, is twice the top row, 192. The third row, 576, is three times the first row, 192. Arrange the numbers 1 to 9 in another way without changing the relationship between the numbers in the three rows. Put all the numbers 1 to 9 in the boxes so that all four equations are correct. Fill in the boxes with a different set of numbers so that the four equations are still correct. • To square a number you multiply it by itself. each other equals the sum of the squares of the two opposite numbers. Put the numbers 1 to 19 in the boxes so that three numbers in a line add up to 30. The top of a box has an area of 120 cm2, the side has an area of 96 cm2 and the end has an area of 80 cm2. What is the volume of the box? A Greek cross is made up of five squares, as shown in the diagram. pieces of different sizes and shapes. • Make four equilateral triangles using six match sticks. Each letter stands for a digit between 0 and 9. Find the value of each letter in the sums shown. 1. Find two whole numbers which multiply together to make 221. 2. Find two whole numbers which multiply together to make 41. 3. I am half as old as my mother was 20 years ago. She is now 38.How old am I? 4. Find two numbers whose sum is 20 and the sum of their squaresis 208. 5. Find two numbers whose sum is 10 and the sum of their cubes is370. 3-3/4 as when it is multiplied by 3-3/4. 1. An amount increases by 20%. By what percentage do I have to decrease the new amount in order to get back to the original amount? 2. The length of a rectangle increases by 20% and the width decreases by 20%, What is the percentage change in the area? 3. The volume of cube A is 20% more than the volume of cube B. What is the ratio of the cube A’s surface area to cube B’s surface area? • To calculate the theoretical probability of an event, you need to list all the possible outcomes of the experiment. • The theoretical probability of an event is the number of ways that event could happen divided by the number of possible outcomes of the experiment. 1. I have two dice, I throw them and I calculate the difference. What is the probability that the difference is 2? How about other differences between 0 and 6? 2. I write down on individual cards the date of the month on which everyone in the class was born. I shuffle the cards and choose two of them. What is the probability that the sum of the two numbers is even? What is the probability that the sum of the two numbers is odd? When would these two probabilities be the same? 3. Toss five coins once. If you have five heads or five tails you have won. If not, you may toss any number of coins two more times to get this result. What is the probability that you will get five heads or five tails within three tosses? 4. You have eight circular discs. On one side of them are the numbers 1, 2, 4, 8, 16, 32, 64 and 128. On the other side of each disc is a zero. Toss them and add together the numbers you see. What is the probability that the sum is at least 70? 5. Throw three dice. What is more likely: the sum of the numbers is divisible by 3 or the multiple of the numbers is divisible by 4?. A paradox is a statement that contradicts itself or a situation which seems to defy logic. That’s a simple definition of paradox. Often premises can be proven false which rectifies the contradiction. Sometimes they are just play on words, however, some paradoxes still don’t have universally accepted resolutions. On this page you can find several good paradox examples to tease your mind. A Cretan sails to Greece and says to some Greek men who are standing upon the shore: “All Cretans are liars.” Did he speak the truth, or did he lie? A week later, the Cretan sailed to Greece again and said: “All Cretans are liars and all I say is the truth.” Although the Greeks on the shore weren’t aware of what he had said the first time, they were truly puzzled. If someone says “I always lie”, are they telling the truth? Or are they lying? This version of a famous paradox was presented by English mathematician P. E. B. Jourdain in 1913. THE SENTENCE ON THE OTHER SIDE OF THIS CARD IS TRUE. THE SENTENCE ON THE OTHER SIDE OF THIS CARD IS FALSE. Analogue paradox to the ‘liar paradox’ formulated by English logician, philosopher and mathematician Bertrand Russell. In a village, the barber shaves everyone who does not shave himself/herself, but no one else. Analogue paradox to the paradox of liar formulated English logician, philosopher and mathematician Bertrand Russell. There was a barber in a village, who promised to shave everybody, who does not shave himself (or herself). If destiny designed a master plan which defines everything that is to happen, isn’t it useless, for example, to go to a doctor? If I am ill and it is my destiny to regain health, then I will regain health whether I visit a doctor or not. If it is my destiny to not regain my health, then seeing a doctor can’t help me. If destiny designed a master plan, which defines everything that is to happen, isn’t it useless to for example go to a doctor? If I am ill and it is my destiny to regain health, than I will regain health whether I visit a doctor or I don’t. And if I shall not be healthy again, than I will not with or without help.